This is a wonderful sandwich and a great way to finish leftover beef. 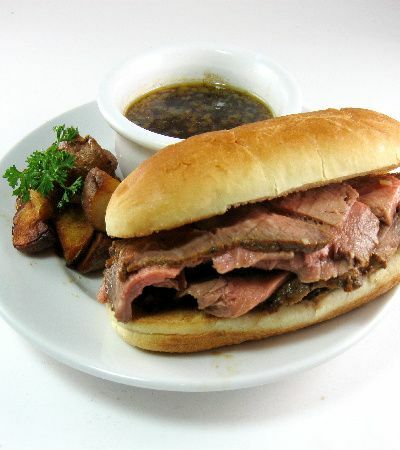 The sauce in this recipe, developed by Rachael Ray , is unusually flavorful and while the original sandwich is made with deli-sliced beef, it translates well to the use of leftover meat, especially if rare beef is used. The main component of this sauce is condensed beef consomme. I know this will be off-putting to many of you, but I'm going to ask you to trust me. A bit of sherry or vinegar will change the nature of the consomme and make it a truly delicious base for a sauce. Most cooks shy away from condensed consomme because of its salty and very sweet taste. It's important to know, that when properly used, it can make an ordinary dish special. I use it quite often in competition recipes where the number and strength of ingredients can determine the success or failure of an entry. As a bit of an aside, in an amateur competition your fate is often determined by a single bite, so it is necessary that contest recipes be strongly flavored and that that first bite explode on the judges tongues. There is a downside to this. Many things become cloying or too rich for the palate with repeated bites. The judges will never know that. I'm not complaining mind you. I've won some wonderful prizes with recipes designed for judges rather than you. I just don't publish them here. I digress. I made two changes/additions to this recipe. I toasted the buns and spread them with a blue cheese butter which you can find here. Other than that, the recipe belongs to Rachael Ray. Here's how the sandwiches are made. 1) In a large, shallow skillet over moderate heat, melt butter. Add shallots to butter and saute 2 minutes. Add flour to butter and shallot and cook a minute longer. Whisk in sherry and cook liquid out. Whisk in consomme in a slow stream. Bring sauce to a bubble and allow to simmer over low heat until ready to serve sandwiches. 2) Pile meat loosely across your cutting board or a large work surface. Season meat with salt and black pepper. Set out 4 ramekins or small soup cups for dipping sauce, 4 dinner plates and 4 split and toasted sandwich rolls that have been spread with blue cheese butter.. To assemble, using a pair of kitchen tongs, dip meat into loose au jus sauce and pile into rolls. Set ramekins or cups with extra dipping sauce along side the sandwiches. Serve hot. Yield: 4 servings.